Metro Radio’s ‘Alan Robson’s Night Owls’ is legendary in this region for the brilliant Hallowe’en shows and this year I wanted to be part of it. I wrote to Alan explaining why I wanted to be involved and asking if we could carry out an investigation, live, at the same time as his show, reporting back when anything happened live on air. A few weeks later I received a letter from Alan, my challenge – stay overnight at Talkin Tarn. Talkin Tarn is a lake covering sixty acres, it is situated in Talkin in Cumbria only a short distance from Brampton. Recently in September of this year 23 people witnessed a bloody apparition walk from the lake in broad daylight, this made front page news in the area. This may have been the ghost of Jessie. In 1850s Jessie was in love with a wealthy man, she wanted to tell his mother of their love but the man couldn’t let this happen as he was also engaged to a rich land owners daughter and Jessie knew nothing about this. Jessie was going to tell regardless of the man’s wishes, he offered her money but she wouldn’t agree to it. So he took her to the lakeside and they made love, the water lapping at their bodies. As they were lost in the throes of passion he held her head under the water while still astride her, he held her head under the water until she stopped moving. He then took her lifeless body and placed it in three sacks and dug a shallow grave about 8 foot from the shore and placed her into it. He then replaced all the mud and rocks back onto her now bloated body. Jessie’s body was never recovered. Another legend is that the lake in the result of a flooded village and that if you row out into the centre of the lake on a clear day you can see the ruined buildings at the bottom of the lake. A bell is said to ring from under the murky depths at midnight. Andrew Markwell, John Crozier, and David ‘Kenco’ Henderson offered to join me on this ghost hunt and all three were very keen to discover what Talkin Tarn had in store for us on Hallowe’en. The night of the dead. We arrived at Brampton station at about 8pm on the night of Hallowe’en, equipped with cameras, torches, tape recorders and lots of warm clothes. We had been to Talkin the previous Saturday to have a look around the place and arrange accommodation. We got into our waiting taxi and were took to the Hare and Hounds where we had booked some rooms. During our journey the taxi driver asked us what we were doing at the lake later in the evening, we told him and he then told us that he had once been driving along the very same country lane that we were on and he had seen a bright green beach ball shaped object land in a nearby field. He told us that he drove on and on his return journey there was a ‘spaceman’ standing at the side of the road holding a gadget that looked a bit like an umbrella. If weren’t already starting to feel a bit anxious about our looming trip to the lake this certainly got our minds wandering. We arrived at the Hare and Hounds and a man called John showed us to our rooms. The Hare and Hounds is an old building and monks used to come here 200 years ago on their way to the nearby Lanacost Priory. We had about 90 minutes left to prepare ourselves. I had two thick jumpers and a fleece to wear, along with a hat and gloves if required. I had 2 disposable cameras, a dictaphone, a torch, spare batteries, disposable gel hand warmers, a flask of hot coffee, and two bars of chocolate. When we had prepared we went down to the bar for a quick pint. The bar was quite busy and everyone seemed to be looking and talking about us – the strangers in town. Talkin is a very small village with a population of probably under three figures so everyone knew that we weren’t local and they also knew that we were headed to the lake hunting for ghosts because on our recce visit we explained that we would be out until about 2am, we were then asked what we would be doing and Kenco replied “we’re involved in activities”, rather than have them thinking we were burglars or members of Al Qaeda I explained the situation in full. At 9:40pm the time had arrived for us to leave on this freezing cold, drizzly October evening as our taxi had arrived, as we gathered our belongings the everyone in the bar were wishing us good luck on our ghost hunt. We arrived in the car park and got out of the taxi. It was pitch black, no moon or stars in the sky, no street lights, no nearby houses, just fields all around us and dense, dark woodland. We immediately turned on our torches and headed to the tearoom as there was a bench underneath a pavilion that we would choose to make our base for this evening. It was so dark that I almost stepped into the lake thinking it to be the pathway. We found the tearoom and decided to stay there for a short while until our eyes adjusted to the darkness and we had time to decide on our next move. The calls of owls and ducks were easily distinguishable although every time a duck ‘quacked’ Andy would say, “listen, a dog”. The lapping of the lake was loud and could often be mistaken for the sound of footsteps, the fact is we were scared and it was fear and paranoia that had us thinking like this. We had to phone Night Owls at 10pm to let them know we were in place but unfortunately every time we tried to call it was engaged. At about 10:20pm we saw a bright flash in the forest to the left of where we were, it couldn’t have been lightning, it wasn’t a firework, what was it? It looked like the flash from a camera but if it was why was anybody there and who were they? I don’t think it was a camera because that woodland is so dark you would need a torch to see clearly enough to move safely and I didn’t see any torch light at all from that direction. Shortly afterwards we heard a car in the car park to the right of us, the door slammed and the car revved its engine then sped off into the night. We weren’t alone and we all knew it. We turned off our torches that had all been lit up until this point so if anyone had seen our torch beams they will have known where we were. We sat there waiting to see torchlight or hear voices or something to let us know where they were and how many there of them there were but nothing. I was beginning to wish I was back in the safety of the bar. At 10:30 we plucked up the courage to make our first trip around the lake. We picked up our bags and torches, swallowed hard and headed off into the darkness. We headed clockwise around the lake, the distance is almost 1½ miles and the majority of it involves walking through the dense woodland that surrounds the lake. We decided to stick together as we were unsure if we were alone and anyone who is out at a dark lake at this time of night is surely up to no good, unless of course they were also ghost hunters. We slowly and quietly made our way around the lake scanning the area ahead and behind us with our torches. I was also looking out into the lake as that was where the ghost of Jessie would emerge from and unfortunately it was virtually impossible to see if anything was there as it was too dark due to there being no moon tonight, but I would often shine my torch towards to water in the hope of catching a glimpse of something. Two thirds of the way around the lake is the Tarn End Hotel and it was fairly well lit so upon reaching that we all felt a little better. We decided not to stop at this point though as four lads wearing black and carrying torches may have looked a little suspicious so we carried on back towards our base. The journey took about 40-50 minutes and I certainly felt a lot better now as we’d been all around the lake and hadn’t seen or heard anyone so I could now concentrate on what I had came for – ghosts. We had a hot drink and sat down to watch the lake for a while in the hope of seeing for ourselves a bloody apparition walk from the lake. I also occasionally looked up to the sky as, you never know, I may have seen the UFO that the taxi driver told us about. At 11:30pm we still hadn’t managed to get through to Night Owls to let them know that we were here so we called the hotline number that is for people who have seen something while on their hunt, to explain that we were here and hadn’t been able to get through. I was considering using the dictaphone to try to talk to spirit as I have done research into recording ghost voices and thought it was worth a try, Andy was a bit worried though so I decided against doing it. At approx 11:45pm something moved in the darkness about a metre in front of us, it was a fox running past and then it disappeared back into the woodland. At midnight we stayed silent hoping to hear the bell that is supposed to ring from under the water but unfortunately we heard nothing. Just after midnight we decided to take our second walk around the lake, this time heading anti-clockwise. What was now obvious was that it had suddenly got darker, it was difficult to make out anything without torchlight, the temperature had also dropped. Not long after we set off I heard a loud splash in the lake about a foot out into the water, I quickly shone some light in that direction but couldn’t see anything. We walked on. The Tarn End Hotel had now turned all of its lights off so we had no extra lighting upon passing that point this time around. I was fairly relaxed but everyone else seemed a bit jumpy, this was proven when Kenco complained when we were passing through a gate and I let it bang by mistake, he complained that ‘Tail End Charlie’ had been letting the gates bang all night. Shortly afterwards I was sure I heard voices behind us, everyone stopped. We listened but nothing. We walked on but every few minutes someone would say “stop, I heard something”, we were all getting a bit jumpy again. I thought I heard horses galloping but I didn’t say anything at the time and nor did anyone else, however, Andy has also done a write up of our trip since and he mentions this in his report (read his report here). We also heard a really loud bang that we had no explanation for. We arrived back at our makeshift camp at about 1am and got out our hand warmers as it was raining quite heavy by now and it was getting colder. I suggested shortly afterwards that we go around the lake one last time but only Kenco and I fancied it so we didn’t go and sat and watched the water. At 1:20am I saw a bright light on the other side of the lake and directly opposite where we were, at the same time Andy spotted a bright light on this side of the lake to the right of us. I also saw this. I thought it may have been a car but we never heard a car arrive so what was it? At 2am we headed back to the car park to meet our taxi and get back to the warmth of our beds. Everyone thoroughly enjoyed our evening at Talkin Tarn, I just wish we had seen the ghost of Jessie. Maybe next time. We heard plenty of odd noises and a few strange lights but unfortunately we didn’t see a ghost. The truth is though that there may have been something there that we didn’t see simply because it was so dark. I’ll probably come back to Talkin Tarn next year probably during a summer month, stay at the campsite and sit by the lake until it gets dark and hope that I am lucky enough to see what those 23 people saw six short weeks ago. 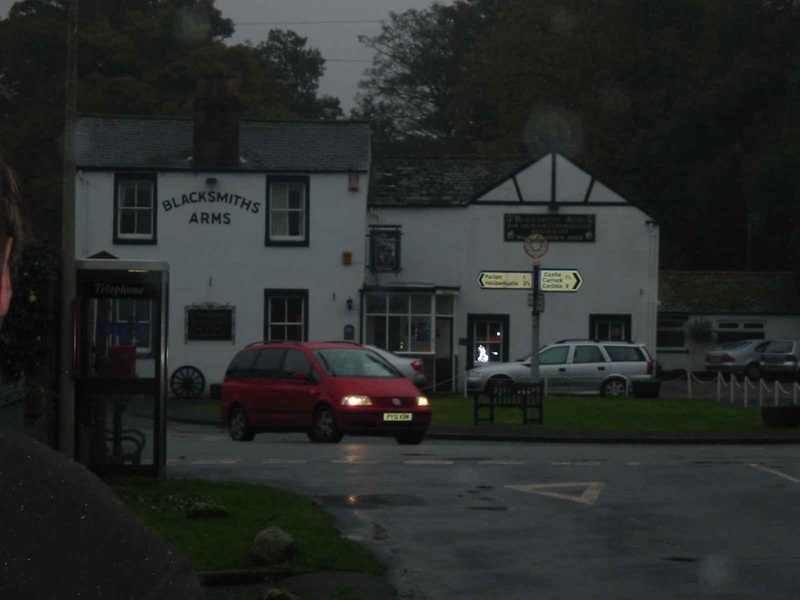 John took the above photo of the Blacksmiths Arms, which is the pub just over the road from where we stayed, the Hare and Hounds. In one of the lower right windows is a bright light, I took a photo of this pub at the same time (7:30am, Friday morning) and there is nothing like that on my photo. What could it be? Car headlights reflecting in the window? Don’t think so. The ghost of Maggie, a former landlady, haunts the pub, could it be her?